Over the past 20 years stalking has increasingly been construed as a social, legal, and psychiatric problem that is distressingly common, causing significant harm to victims. Research in this area has demonstrated that there are recognizable features that groups of stalkers share and, by increasingly sophisticated classification, it is possible to make predictions about this phenomenon. It is anticipated that a new proposed classification can increase our ability to manage risk. I was recently asked by a prosecuting attorney the following question, “If we allow the plea (of insanity), won't every male batterer who stalks his ex get off?” In the current construction of stalking behavior, the paradigmatic scenario of a breakup of husband and wife, with subsequent harassment, threats, and violence, predominates.1 While such a pattern is certainly common—an estimated 39 percent of female victims are stalked by their ex-partners2—it should be remembered that stalking is a complex behavior arising out of an interaction between the perpetrator and the victim in a specific psychosocial context. In the case cited above, five eminent psychiatrists had diagnosed a psychotic disorder (delusional disorder) in a young man who invested 15 years of his life in stalking a woman with whom he had had a platonic relationship. The research into stalking is a recent phenomenon. Over the past 20 years, several brave pioneers have stepped into the fray and suggested stalking typologies. Some jurisdictions have enacted antistalking legislation7 that has effectively nudged the assessment and treatment of stalkers and their victims into the province of psychiatrists, especially forensic psychiatrists. In particular the assessment and management of risk has become a major concern. I would argue that a classification system is essential to this process. In the 1980s, Kendell,18 one of the deans of nosology in psychiatry, made the case that, although psychiatric diagnoses have serious shortcomings, they are nevertheless important in that they are a convenient mode of communication, describing at least one essential characteristic of the patient that he shares with members of the same class. Diagnoses are essential if we are to move forward in areas of research and needs assessment. They are also helpful if they can direct us toward management, treatment, and prognosis, as is commonly the case. Kendell affirmed that a psychiatric diagnosis cannot generally be easily confirmed by laboratory tests, in contrast to many medical diagnoses, and that they may convey relatively little information about etiology. He directs us to continue to broaden our knowledge base to develop increasingly helpful classifications. One of the first published attempts at classification was related to threats to members of the United States Congress.19 The authors analyzed 1800 letters to celebrities and also letters to members of Congress and compared the subjects who pursued encounters to those who did not. Holmes20 proposed six types of stalkers based on relationship to the victim. He considered celebrity, lust, hitman, lovelorn, scorned, political, and domestic stalkers to be the major groups. Zona et al.21 studied police case files and were able to divide them into three significant groups based on a proposed psychiatric diagnosis: erotomanic, love obsessional, and simple obsessional. It is noted that only nine percent fell into the erotomanic group. The love obsessional group appeared to be composed mainly of persons with personality disorders. The authors were able to make some observations relevant to risk management based on their classification, noting for instance that those exhibiting erotomanic delusions stalked for the longest duration and that simple obsessional persons stalked their victims for a short period but were more likely to assault them. Meloy and Gothard22 coined the term “obsessional followers” and noted that they may suffer from erotomanic delusional disorders and personality disorders other than antisocial personality disorder. Harmon et al.23 were the first to use two axes based on a study of 175 “obsessional harassers” referred by the courts. They proposed approaching the relationship between the stalker and victim in two ways. The first axis described the type of attachment and the second axis referred to the type of previous relationship, such as personal, professional, work place, or acquaintance; perceived connection to a media personality; or no relationship. They noted that 29 percent of their cohort met the criteria for delusional disorder. Other authors have looked at the differences between psychotic and nonpsychotic stalking. Kienlen et al.24 noted that psychotic subjects visit the victim's homes significantly more often but the nonpsychotic subjects make more threats and are more violent. The RECON (relationship and context-based) typology of stalking25 used a large sample with information from multiple sources and focused on the relationship, in particular whether there was a prior relationship. They deliberately attempted to make the scheme simple for utilitarian purposes, so that it could be used by various disciplines and for research. Sheridan and Boon26 studied 124 stalking cases and produced a classification system comprising four major typologies: ex-partner, infatuation, delusional-fixation stalking (dangerous/less dangerous), and sadistic stalking. From their analysis and experience, they provide a guide to law enforcement agencies and others that is intended to provide clear strategies for risk management. This system is elegant in its simplicity and profoundly important if indeed the guide to risk management is accurate. However, its utility has not been tested by empirical studies, and it must therefore be viewed as tentative at this stage. Phillips27 has published a treatise on presidential and celebrity stalkers, based on his extensive experience and observations as a consultant to the U.S. Secret Service. He notes that it is the very nature of celebrity status that attracts the attention of the public. Presumably, this attention can be positive or negative, analogous to the knife edge of love that, as is very clear from the literature, plays a central role in stalking. It is the prominence of royalty and political figures that makes them vulnerable to the scrutiny of the public and the subsequent strong emotions inevitably engendered in this process. It is hypothesized that there are significant differences in those who stalk prominent figures compared with other types of stalkers, because of the artificial and special relationship that exists between the parties. For the purposes of this article, I have used the term “prominent figure” to include celebrities, royalty, heads of state, politicians, and other public figures. Phillips27 compares and contrasts stalkers of prominent figures with stalkers of others. For example, he believes that the rejected stalker of a prominent figure is likely to be psychotic, in that the relationship is a delusional misrepresentation, in contrast to the rejected ex-intimate stalker. However, the aim of both types is to effect reconciliation or, if their advances are rebuffed and their love unrequited, revenge. In the category of intimacy-seekers, both groups are likely to be delusional. Both are encouraged by misperceptions of the target's response. However, in the case of the celebrity stalker, the responses may in fact be returned by a member of the entourage, perhaps in the form of a boilerplate signed photograph, sometimes expressing vague and potentially misleading expressions of good wishes or even love, which fuels the motivation of the intimacy-seeker and nourishes the delusion. To emphasize the differences, Phillips27 adds five additional descriptive categories, effectively making a typology of stalkers of prominent figures. He includes Mullen's resentful group, noting that they are generally driven by anger and are not likely to be psychotic. He also includes a group of individuals whom he calls pathologically obsessed, who are more likely to act from the basis of persecutory or grandiose delusions. They may consider that the prominent figure is responsible for their problems and therefore seek retribution by assassination. These persons may intend to harm the victim and should be considered dangerous. A group that he calls the infamy-seekers is described as having severe characterologic disturbance. They are often driven by political ideology, using assassination as a means to an end, to draw attention to themselves or to their political demands. They are not psychotic but are considered potentially capable of carrying out the plans. It should be noted that in the cohort of James et al.,14 two of the five who appeared to fall into this group were psychotic, although they held idiosyncratic political views that were perhaps interwoven with their delusions. Also described are the attention-seekers or the nuisance group who repeatedly approach prominent figures, such as the President, to either provide or seek help. These persons are described as grandiose and narcissistic and may be psychotic. They are generally not considered dangerous. Within this group, there appear to be heterogeneous motivations. Some may want the prominent figure to resolve a particular problem or may seek redress. Others offer their services, believing they can assist or advise the president. They may be thought-disordered. Yet another group may simply want to be seen with the president or be noticed. They are classified together for convenience, although this is a debatable strategy if an emphasis on motivation is the goal. Mullen and colleagues28 describe how classifications should convey information about shared characteristics of similar groups. They note that it is convenient to use classifications in professional circles, since they are a kind of shorthand. Diagnosis in medicine is generally used to indicate the type of treatment that is indicated. The diagnosis may also provide a guide to prognosis. 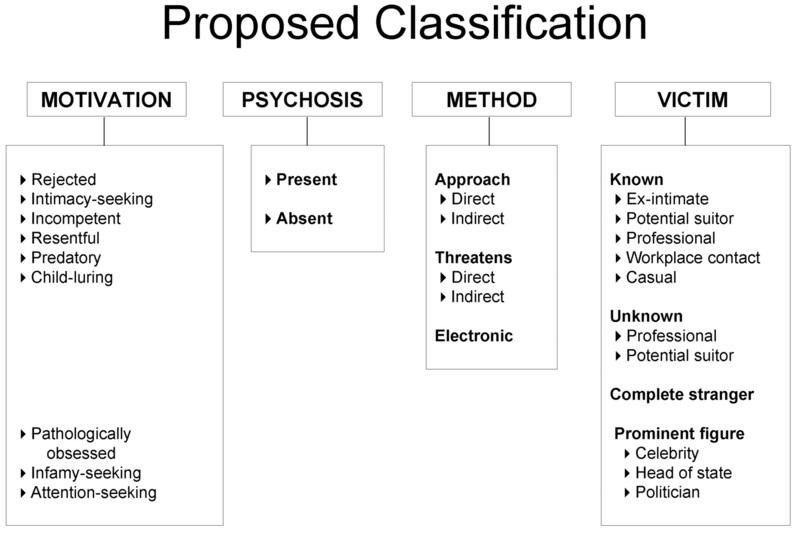 The authors explain, with reference to the multiple typologies of stalking, that these different classifications may vary, depending on who is employing the classification. Mullen et al.29 studied the clinical records of 145 stalkers who were referred to a community clinic that received referrals for stalkers and victims. They expanded the pool to 168 stalkers for their final sample. They used a specific definition of stalkers for their purposes that included the criterion that the stalking must be repeated at least 10 times and must last for 4 weeks, therefore being deemed persistent. They included the criterion that the attempts were unwelcome and involved an approach or communication with the victim. They noted that their method of classification “at least aspires to be multi-axial” (Ref. 29, p 75). The first axis is concerned with the motivation and context that appears to precipitate and perpetuate the behavior. They proposed five types of stalkers that included the rejected, the intimacy-seeker, the resentful, the predatory, and the incompetent. These descriptors attempted to describe the needs, desires, and goals of the stalker. Axis 2 referred to the stalkers' relationships to their victims. For instance, victims may be classified as ex-intimate partners, professional contacts, people whom the stalkers knew from work, casual acquaintances, celebrities or even strangers with whom they had had no prior contact. For the purposes of Axis 3 they used a simplified division of psychotic versus nonpsychotic. From this typology Mullen et al.29 were able to make predictions about various aspects of the stalking behavior, including the type of stalking, how long it would last, the risk, and to some extent the response to management strategies (Ref. 29, p 76). The Group for Advancement of Psychiatry (GAP) Committee on Psychiatry and the Law, who studied stalking for three years and produced a book on it,10 noted that the classification in Mullen et al. represents “a most useful, comprehensive scheme available to clinicians for classifying stalking behavior” (Ref. 10, p 46). In the interest of full disclosure, I should state that I was part of that committee. In a recent article in this Journal, Mullen et al.12 proposed an approach to managing risk in stalking that is consistent with current literature on the assessment of risk and its management.30,31 They propose that the knowledge and principles that are extensively discussed regarding risk management can be applied to stalking, and the clinician can then develop a stalking risk profile to formulate a structured professional judgment approach to the management of this risk. They wisely include a caveat, warning that stalking is a complex behavior encompassing a range of potentially fluctuating and interrelated factors and that risk therefore changes over time. It is for this reason that risk assessments, in practice, must be reviewed and updated as the circumstances change. In their innovative approach, Mullen et al.29 incorporate five domains of factors inherent in the situation. These domains include the nature of the relationship between the two parties; the stalker's motivations; the psychological and social realities of the stalker; the psychological and social vulnerabilities of the victim; and the legal and mental health context in which the stalking is occurring. They note that one of the primary goals of this process is to establish the type of stalker, thereby facilitating the understanding and prediction of the future course of the relationship. They use an ingenious algorithm to attempt to establish the stalker type. They suggest that with this approach, in association with clinical judgment, a risk management plan can be devised based on certain generalizations and similarities among the types. Nosology is an evolving phenomenon in this relatively new topic of research. By necessity, it must change when new research opens up new avenues of discourse. In the article by James et al.14 as well as the work by Phillips15 it is suggested that specific characteristics may apply to those who stalk prominent figures, which suggests that there are additional areas that should be considered in the system of classification. In assessing the perpetrators of stalking in this population, these works propose that there is a higher incidence of psychotic illness and that the knowledge and understanding of ex-intimate stalkers need not be applied. Another aspect of stalking that has come to public prominence is that of child-luring.32 Since this is a relatively new area of discourse coinciding with the growth of the Internet, few researchers have applied themselves to the topic thus far. One group of researchers has begun to gather momentum in this area, although much work is needed.33 During my involvement with GAP, we discussed extensively whether this phenomenon should be included as a type of stalking. If we look again at the definition in Mullen et al.,28 we see that they use the one that describes repeated, persistent, unwelcome approaches. It could also be argued that the stalking is directed toward instilling fear in the victim. In child-luring, the approach does not specifically induce fear or anxiety in the victim and is not at first unwelcome, but I argue that if the victim knew the true motivation of the perpetrator, the approach would be unwelcome and would induce fear and anxiety. Certainly, there is no doubt that the approach is unwanted and would induce anxiety and fear in the parents or guardians of the victim. I therefore conclude that child-luring is a new and specific form of stalking that deserves a distinct category in any classification system (Figure 1). A multiaxial approach to classification of stalkers. I also suggest that it may be helpful to include the method of stalking employed in any typology. I propose this somewhat tentatively, since the stalker may move from one method (for instance, telephone calls) to another (perhaps approaching the victim's residence or work place), suggesting an escalation in the stalking behavior. The issue of whether a stalker moves from one category to another has to be taken into account in assessing risk; as just noted, as circumstances change, the probability of risk and its subsequent management have to be reassessed. In descriptive terms, the inclusion of an axis referring to method conveys significant information that may be useful in risk assessment and management. I hypothesize that this multiaxial approach to the classification of the stalker may help delineate factors that are helpful in the management of the situation, with the intention of alleviating anxiety and decreasing the danger to the victim. I have used this approach in my clinical work and found it to be useful, but further work is clearly necessary to validate the system. As new research on these topics emerges, this system, like any other, will evolve and eventually be replaced. It is likely that an algorithm based on the work of Mullen et al.12 will evolve to increase our competency in this area.